Students today have much higher expectations of their living spaces than in the past, and these renovations give them just that. 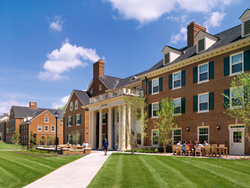 Woolpert is providing structural engineering services for the renovation of three Miami University residence halls as part of the public university’s long-term goal to provide the best undergraduate experience in the nation. Woolpert was contracted by GBBN Architects, who was hired by Messer Construction, to improve site work, architectural finishes and details, life safety features, better access and functionality and energy-efficient mechanical systems to Scott, Minnich and Stanton halls. These updates are part of the Miami University 2020 Plan, unveiled in 2012, which outlines enhancements throughout the university from academics to culture to infrastructure. Scott Hall and Minnich Hall, which are on university’s Central Quad, began the renovation process in 2016 and reopened for students this month. Schematic design for the renovations at Stanton Hall, on the South Quad, are in progress, and that residence hall is scheduled to be completed in 2020. These renovation projects are valued at a combined $50 million and will be completed using design-build project delivery. Woolpert Structural Engineering Manager Frank Monastra said ensuring Americans with Disabilities Act (ADA) compliance and updating architectural and mechanical systems at each building to meet a consistent design standard have been key aspects of these projects. Woolpert has worked with Miami University since 2001, supplying civil engineering and landscape architecture services for a variety of projects. The international architecture, engineering and geospatial firm also has performed similar renovations at campuses across the country.